Anxious as the author himself to discover at last the coast of New Caledonia, we shall leave without lingering over these stories staging the crew of the schooner " La Calédonienne ", the description of the two picturesque French passengers, the two days of stormy weather, the cockroaches, the whales, the flying fishes, the shark met and described as by a naturalist. Let us not speak either about the two islands " with highest walls in the world " by 31 ° 36 ' of latitude south & 159 ° longitude nor about the precarious pass between the coral reef of the lagoon before finding the description of the arrival after thirty six leagues covered in the fortnights of eventful sailing. 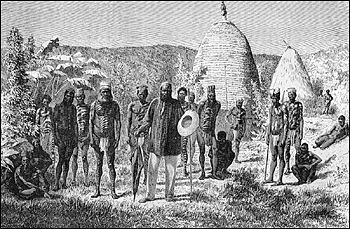 "However we entered Nouméa's natural harbor the chef lieu of the isle. In front of us, the horizon narrowed more and more; we crossed a straight pass, between the " Point of the Artillery " and an island: here we are in the harbor, happy to be at the end of such a long journey, but full with a vague anxiety. Well I was in one of these oceanic islands where the recollections of the readings of the young age showed me people olive greenish, bare, wild, decorated with feathers, with arrows and with fragments of human flesh in the hand; and I was going to live in the middle of them, to investigate their mountains to share their way of life! These recollections and the thoughts were little reassuring, and, as I said it openly, I was worried. "New Caledonia is lying in the southern hemisphere, among the 20 ° 10'et 22 ° 26 ' of latitude south and the 161°35 and 164°35 of longitude east of the meridian of Paris; it has about two hundred leagues in the east of the New Holland, and about 250 leagues in the North the New Zealand, these big lands, asylums of the solitude and the inhumanity less than hundred years ago and what England transforms every day at the very image of Europe. 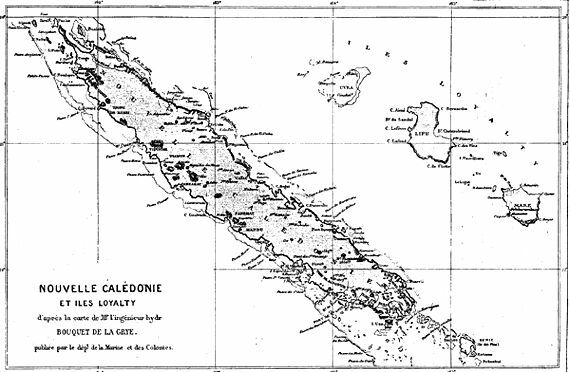 New Caledonia goes from the northwest to the southeast; it raises over waters a long strip seventy-five leagues in length, wide of thirteen; this weak width allows the breezes of the sea to circulate everywhere, cooling and cleansing the atmosphere; here reign trade winds, that is, in this hemisphere, South east winds."